Synopsis: A popular video game comes to the screen with this big-budget adventure starring Angelina Jolie as a buxom heroine recalling equal parts Indiana Jones and James Bond. Jolie is Lara Croft, a proper British aristocrat groomed at schools for the children of the elite. Croft leads a double life, however, as an acquirer of lost antiquities through questionable means, highly trained in combat skills with the help of a robotic opponent called Simon. Despite her exciting profession and a life of wealth and breeding, Lara pines for her father, Lord Croft (Jon Voight), whose passing left her orphaned. 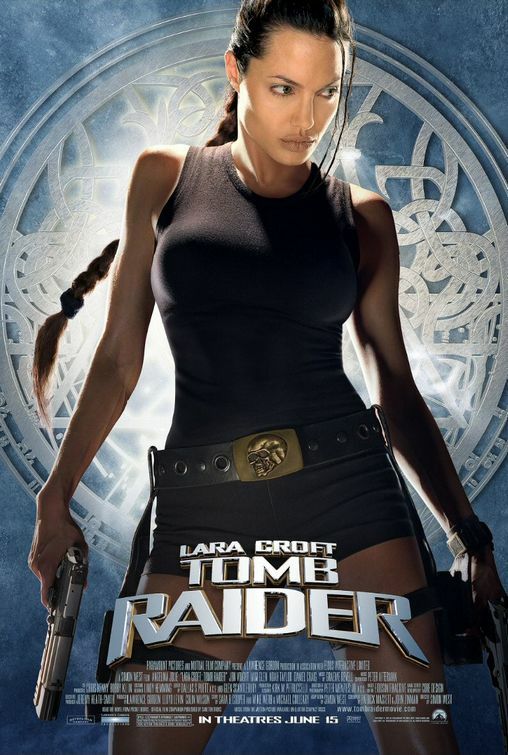 On the eve of a celestial event that will also mark the anniversary of Lord Croft's death, Lara comes up against an ancient organization called the Illuminati, represented by the sinister Powell (Iain Glen), who's in pursuit of an ancient relic with power over time and even death itself. With the aid of her high-tech support team, Lara travels to some exotic locales in search of the artifact, including a foray into a decrepit Asian temple guarded by lethal stone apes and other creatures that spring to life. Filmed at various locations in Great Britain as well as Iceland and the Angkor Wat temples of Cambodia.